Fully refurbished HP Laserjet II, please also check below for the accessories we offer for the series II. If you have any questions feel free to Email, FAX or Call us. We also offer REPAIR service on this model of printer, if you wish to have your printer Repaired please Go Here. Duty Cycle(pages per month) 12,000. 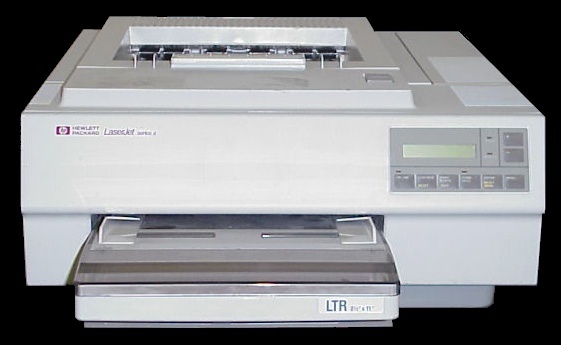 The laserjet II is great for the small to medium office and home use. A workhorse of a printer which will go many 10's of thousands of pages with no maintenance. The reliability of this series has keep it a popular printer even years after it has been discontinued. Many companys claim their printers are refurbished, however because there is no real industry standard for what is "refurbished" some companys claim to have refurbished the printer they are selling you when in fact they have done very little to nothing as far as replacing what needs to be replaced in the printer for parts. Here at M&J we strive to bring each printer we refurbish as close to new quality as possible and still keep the costs low enough where it is affordable. If you would like to learn what steps we take to refurbish your printer please see our "Steps to a refurbished printer from M&J Printers". What kind of warranty do your printers have? Our printers each come with a 90 day warranty. It covers everything except the toner cartridge . If your printer is damaged in shipping we will ether send a replacement or have you return the printer for repair or refund. If you buy a printer from M&J all labor is covered for the lifetime of the printer. This means that if after the 90 days your printer breaks down or just needs maintenance of any type and you send it back to us you will not pay any labor costs to repair it, only parts and shipping. The lifetime of the printer means for however long you own it we will warranty the labor costs to repair it, given parts are still available for the given model of printer. To view our warranty page please follow "This Link".